Bruce Kaji in front of the former Nishi Hongwanji building in Little Tokyo, where the Japanese American National Museum opened in 1992. 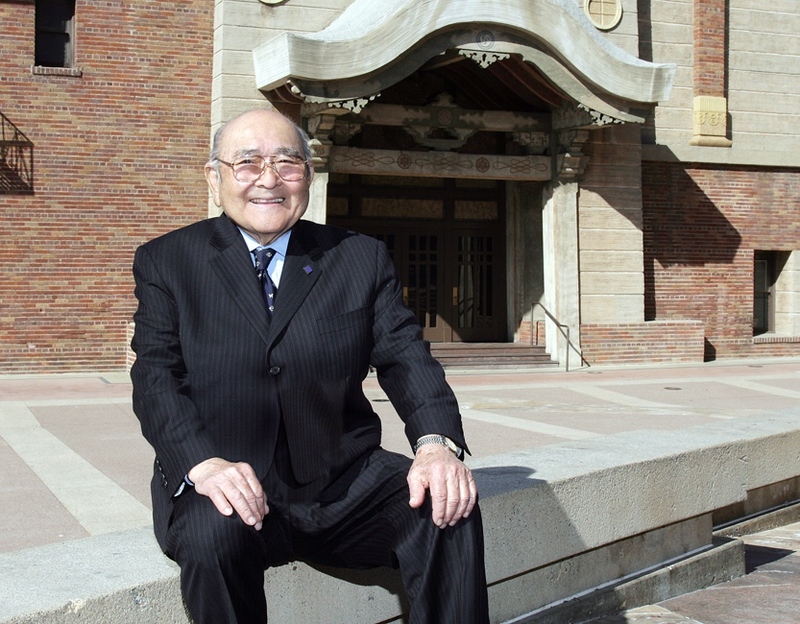 The Japanese American National Museum is deeply saddened by the death of the museum’s founding president, Bruce Teruo Kaji. He was 91. Earlier this year, JANM presented Bruce with its Legacy Award, established to recognize individuals who have made a lasting contribution to the museum’s institutional legacy and helped distinguish the museum as a unique, vital, and valuable community resource. Kaji was without question a deserving recipient of the award. Bruce Kaji was incarcerated in the Manzanar concentration camp during World War II and served in the Military Intelligence Service during the occupation of Japan. He therefore understood first-hand both the discrimination he and his community endured and the outstanding military service he and other Japanese Americans contributed to the United States. These were stories that were not well known or documented, and he was determined to change this. Born in the Bunker Hill district and raised in Boyle Heights, Bruce returned to Los Angeles after the Occupation and earned his degree in accounting from the University of Southern California. After forming an accounting partnership with Kiyo Maruyama, his firm landed a major client in Toyota Motor Sales, USA. Bruce also pursued public service and was elected Gardena city treasurer in 1960. It was then that he developed strong relations with Los Angeles city and county officials such as Councilman Gilbert Lindsay and Supervisor Kenneth Hahn. After the City of Los Angeles used eminent domain to take possession of an eight-acre block of Little Tokyo to build its police department headquarters, Bruce and the Rev. Howard Toriumi of Union Church led the fight to establish the Little Tokyo Redevelopment Association to help protect their community. In 1962, Kaji and a group of Nisei investors organized Merit Savings & Loan. For more than 30 years, Merit served as one of the few Japanese American-owned and managed banks. The Japanese American National Museum was incorporated in 1985 and it was at Merit that initial fundraising began and the museum’s first employee, Nancy Araki, worked in a converted janitor’s closet. Bruce was instrumental in securing a lease for the former Nishi Hongwanji Buddhist Temple building in Little Tokyo to be the museum’s site and in securing funding for renovation of the building. He was also instrumental in the hiring of the museum’s first executive director, Irene Hirano (now Irene Hirano Inouye). Her arrival marked the start of several key developments that would ultimately lead to the opening of the museum in 1992. “Bruce Kaji was a pillar of the Japanese American community in Southern California and it is not an exaggeration to say that without his visionary leadership, the Japanese American National Museum might never have been founded,” said Norman Y. Mineta, chair of JANM’s Board of Trustees. “Though it is little consolation, we are thankful for having had the opportunity to recognize Bruce and his invaluable contributions to the museum, in person, at our Gala Dinner in May of this year. He was a champion of JANM right up until the end. Bruce (who adopted his English first name in honor of his childhood hero — Batman’s secret identity, Bruce Wayne) married Frances Tashiro in 1954. Frances was the daughter of prominent physician Dr. Kikuwo Tashiro, who founded the Japanese Hospital of Los Angeles in 1927; she preceded him in death in November 2016. Bruce, who learned to play the trumpet in Manzanar and played with the band the Jive Bombers, wrote his autobiography, “Jive Bomber: A Sentimental Journey,” in 2010. Services for Bruce will be held at 10 a.m. on Saturday, Nov. 11, at Gardena Valley Baptist Church, 1630 W. 158th St., Gardena.